In the year 2000, the Scottish Stone Liaison Group (SSLG) was founded. Its remit is enhance availability, promote utilisation and advance knowledge and skills in design, specification and use of indigenous Scottish stone in existing and new build projects. One of its first decisions, working from the Historic Scotland Technical Advice Note No 21 entitled 'Scottish Slate Quarries', was to look at the old Scottish slate quarries and to propose the carrying out of tests to determine the quality of the slate reserves still available. Within seven months, SSLG secured permission of all parties that had an interest in their proposal: Ballachulish and Glencoe Community Council, the mineral rights holder, the landowner, Highlands Council, SEPA and SNH. Financial support from Lochaber Enterprise and the Highland Council underpinned finance made available from Historic Scotland which enabled the test to proceed. Scottish slate, also found on the island of Easdale, south of Oban, and at the Hill of Foundland, Aberdeenshire, where test extractions were also undertaken, is of Dalradian age. The Ballachulish slate is part of a Middle Dalradian marine sequence and stratigraphically overlies the Ballachulish Limestone. The slate beds are widespread and suggest long periods of quiet sedimentation over a wide area, providing little input of silt and sand. 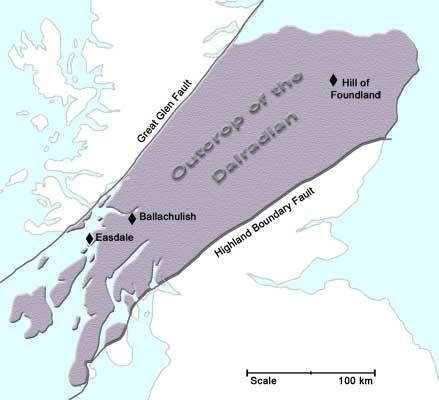 In the Ballachulish area, the whole succession is inverted as part of one of the famous Dalradian nappes. The planned extraction of slate at Ballachulish was scheduled for the Spring of 2001 but the outbreak of the Foot and Mouth Disease resulted in the entire project being placed on hold‚ and it was only resurrected later in the following year. During the week beginning the 19th September 2002 the first blocks of Scottish slate for some 50 years were extracted from the Khartoum Quarry, Ballachulish. The work was undertaken by a slate producing company using pneumatic drills, diamond saw cutting and finally freeing the blocks by the use of black powder charges. The blocks were then transported to the company's production sheds to be riven into slate. From there, the samples were forwarded to the University of Paisley for analysis. The local Ballachulish & Glencoe Community Council, having agreed to the test extraction, was naturally concerned at the possible outcome of these tests. A delegation, lead by its then Convener Mr I Brown, paid two visits to the site towards the end of the week to view the work undertaken. A Report of the University of Paisley which contained an analysis of the slate block was prepared and sent initially to the funding bodies. This report indicated that the slate was of a very good quality with a life expectancy exceeding standard slate by 200%, though the samples available did not split very well. On the 18th August 2003, the SSLG Chief Executive met with the Ballachulish Community Council and the Councillors present were advised of the results and it was subsequently agreed to enable a coring exercise to be undertaken. In the summer of 2004 this was completed, coring some 40 metres into the hillside, and the University of Paisley is again analysing the material secured. It is anticipated that the results of both exercises will be published by Historic Scotland in due course.